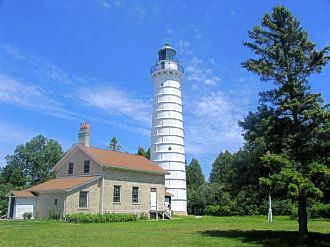 Cana Lighthouse, one of a dozen lighthouses erected along Door Country's perimeter in the 19th Century to guide passing vessels in Lake Michigan. DOOR COUNTY, Wis. -- A 70-mile limestone finger juts out into the northwest corner of Lake Michigan, defining the great Green Bay. Door County, which occupies the northern two thirds of this peninsula, has often been called the Midwest's Cape Cod. That's an accurate assessment. First there's the peninsular similarity. Like Cape Cod, Door County is long and narrow, fringed by more than 300 miles of stony shoreline. There's a bay side to the peninsula and an open-water side to Lake Michigan and abundant aquatic activities: Fishing, swimming and snorkeling, sailing and even surfing, with or without the wind. The steep bluffs along this peninsula's western side are part of the Niagara Escarpment, the thick, limestone ledge that sweeps across the bedrock basin of the Great Lakes, and they were further shaped by the mile-thick glaciers that scoured the landscape 20,000 years ago. The ice melted, leaving thin soil and shorelines serrated by rocky reefs and sharp shoals that made navigation of this inland sea precarious for even early travelers. Indeed, the 17th century French explorers who first gave name to this then-forested peninsula called it Porte des Morts, or Door of Death, after the narrow strait at its northern tip. Although a reference to a much earlier battle between the two Native American tribes who inhabited the area, the name was also an apt description for the treacherous channel whose constantly changing winds and cross currents claimed many ships in the age of sail and well into the age of steam. So dangerous were these waters, a dozen lighthouses were erected along Door County's perimeter between 1850 and 1880 to guide passing vessels. A canal completed the following year between Lake Michigan and Sturgeon Bay shortened the dangerous journey around the peninsula and made its northern two-thirds into something of an island. Settlers from abroad began arriving to make homes in Door County -- Belgians in the south; Norwegians, Danes and Swedes in the north; even a sizeable Icelandic settlement on Washington Island off the peninsula's northern tip. Water access was easy, and tiny villages sprouted in coves and inlets around the peninsula: Egg Harbor, Fish Creek, Ephraim, Sister Bay, Rowleys Bay, Jacksonport and a dozen other smaller settlements. Looking south at Door Bluff Headlands from Washington Island. In addition to commerce and shipbuilding, they fished and also cleared the forest and established agriculture. The peninsula's thin soils weren't fertile nor its growing season long enough to support major endeavors, but its relatively dry climate tempered by the lake waters were suitable for orchards and vineyards, and especially for cherries. For decades, most cherries consumed in the United States were grown in Door County. Winters were hard and long, but the climate and situation the rest of the year were so sufficiently agreeable that many of the German prisoners of war detained in Door County during World War II opted to settle here when hostilities ended. But what most transformed Door County in the last century were its pastoral charms and balmy lake breezes, as vacationers discovered its summer charms. The first tourism enclaves sprouted a century ago, and though Door County now boasts hundreds of hotels, inns, guest houses, B&Bs and vacation rentals, it has not been overrun by brand-name chains or large developments. That's surprising, considering that its year-round population of fewer than 30,000 swells to 250,000 in the summer. And the importance of preserving nature was also realized early. 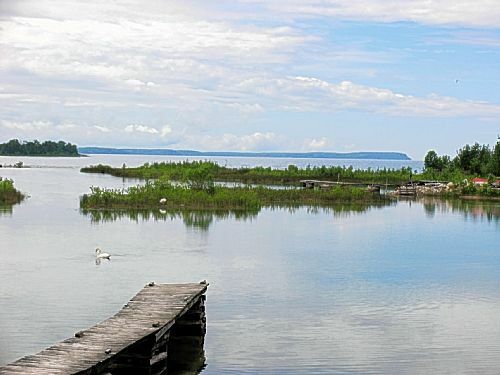 In 1909, 3,700 woodland acres, an 8-mile stretch beneath the Bayside bluffs to Eagle Harbor, were set aside as Peninsula State Park, the first of five Wisconsin parks now known as Door County's jewels. Another dozen county parks punctuate the landscape. These parks certainly occupied much of our attention during a trip there in June, when we were invited by the Door County Visitors Bureau to check out the area. One morning, we pedaled 12 miles on a bike trail that wound though the woods of Peninsula State Park along the Green Bay to Eagle Harbor, passing the decommissioned lighthouse on its rocky bluffs. Other cyclists sped by on the paved road, along with strollers and Segway people movers. Another afternoon, we found ourselves on the Lake Michigan side at Whitefish Dunes State Park, an 867-acre expanse that includes a northern hardwood forest and the state's largest and most significant dunescape. Families scampered along the wide, sandy beach, and snorkelers bobbed in the waves. On a third day, we took ferries to Washington Island and Rock Island, both off the peninsula's northern tip. As mentioned, Washington Island was settled by Icelanders, who found its 36 square miles reminiscent of their home. Still entirely rustic and rural, its residents cherish their past and welcome folks who appreciate it. Tom Carpenter, a carpenter from Wilkinsburg, who now lives on Washington Island in Door Country, in front of a barn he's building by hand at the Farm Museum. At the island's Farm Museum, we encountered Tom Carpenter, an affable carpenter from Wilkinsburg, who moved to Washington Island 11 years ago. 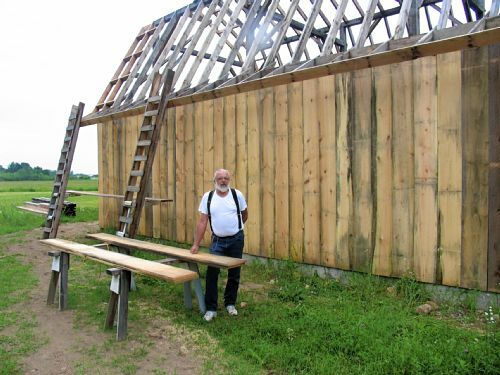 He is building a barn by hand at the museum. We also visited Schoolhouse Beach, a perfect alcove lined by polished limestone pebbles, and Jacobsen's Museum, an eclectic collection of memorabilia assembled by one of the island's early settlers. Rock Island State Park, which covers the 950-acre island that is the northern tip of Door County, is roadless. It's a 3-mile hike from the ferry pier to Pottawatomie Light, Wisconsin's oldest lighthouse. Built in the 1850s and now lovingly restored and maintained by a nonprofit, the handsome brick structure towers over the straits where Lake Michigan and Green Bay meet. The docent couples who stay at the electricity-less lighthouse for a week during the summer happily show visitors around, even up to the tower where, for 125 years, the Fresnel lens guided ships to safety at night. Magnificent, historic, accessible and unspoiled, it was the highlight of our exploration, and not only in the northerly sense. Also lovely was kayaking under the bluffs around Ellison Bay or through the choppy waters and shoals of Baileys Harbor on the lake. We could have gone fishing, scuba diving, para-sailing, even zip-lining, had we been so inclined. All this is not to imply that NorDor, as the locals refer to that part of the peninsula north of Sturgeon Bay, has any shortage of activities. There are cherry orchards and vineyards to visit; art galleries, crafts shops and flea markets to browse; a dozen golf courses and more than 60 sites on the national historic register. And there are plenty of places to just lay back and do nothing. Nor is there any shortage of establishments to dine and drink, from excellent casual cuisine to happening beachside bistros. During our stay, we enjoyed wonderful frozen yogurt, stuffed French toast and a fish boil, an outdoor preparation involving whitefish and kerosene. But for our ticket, the most pleasant Door County surprise (and Cape Cod similarity) is its abundance of high-quality, long-established, inexpensive professional theater. Staging performances each summer since 1935, the Peninsula Players claims to be America's oldest professional resident summer theater. One evening we saw an excellent, Broadway-caliber production of "Heroes," a dark, three-character political comedy by Gerald Sibleyras and translated by Tom Stoppard, in the Players' new theater in its woodsy campus by the Bay near the village of Fish Creek, a splendid setting for summer thespians. A bit up the road in the outdoor amphitheater at Peninsula State Park, the American Folklore Theatre stages a rotation of professional musical and dramatic productions through the summer, weather permitting. Door Shakespeare also produces two plays each July and August, and there are a host of other smaller acting companies at work as well. Theater-loving summer visitors can enjoy a different show each night of the week, and that alone make Door County a bit of heaven. Who knows, perhaps folks will start calling Cape Cod the Door County of the East. Door County's closest commercial airports are Green Bay and Milwaukee, but most visitors drive. From southwest Pennsylvania it's a 700-mile trek around the southern end of Lake Michigan and through Chicago, which can add time to the otherwise 11-hour journey. On our return trip, we opted to take a short cut -- across Lake Michigan. From May 28 to October 3, the SS Badger, a 410-foot long “car ferry” sails daily between Manitowac, Wisconsin and Ludington, Michigan. The approximate five-hour, 90-mile crossing pares some 200 miles from the drive to/from Pittsburgh, and is an interesting experience in and of itself. The venerable vessel is North America’s last coal-burning steamer and is listed on the National Registry of Historic Places. Rather than the 180 or so trucks, cars, buses, RVs, and major construction vehicles she carries on an average voyage today, she was launched in 1952, one of the last vessels to accommodate railcars, as entire trains were shuttled back and forth across the lake for over a century. Car ferries became obsolete in the 1970s, and all but the Badger were sold for scrap. Saved by car ferry fans, she was refitted to accommodate smaller vehicles and relaunched in May 1992 to provide seasonal service across the lake. Our crossing may not have actually saved that much time, but it was time well enjoyed, as a fascinating introduction into a history and tradition about which I knew nothing, an appreciation of the parking performance involved with loading and unloading, not to mention he pleasures of a sunny afternoon spent cruising across a beautiful body of water. Door County Visitor Bureau: www.doorcounty.com. Check out the "Explore the Door" series of more than 50 video podcasts hosted by Jon Jorash, which offer engaging glimpses of just about everything there is to see and do. During our 4-night visit, we enjoyed two historic hostelries. The Evergreen Beach Hotel in the village of Ephraim, one of the peninsula's first inns, has been accommodating summer guests since 1897 (www.evergreenbeach.com). The Black Walnut, a charming four-guest room B&B in a beautifully restored and immaculately maintained 1899 gabled house on a quiet street in Sturgeon Bay, felt like a home away from home (www.blackwalnut-gh.com).